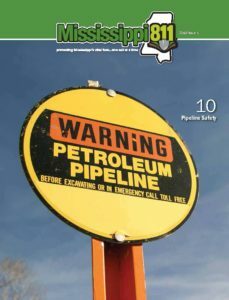 Locate requests should be called in by the person or company that will be performing the actual excavation in order to be covered by the locate request number provided by Mississippi 811.MS Law 77-13-5 (1) (c) requires excavators to notify owners of underground facilities at least two (2) and not more than ten (10) working days (Saturday, Sunday and legal Holidays excluded) before digging. Marking your proposed excavation site with white paint or white flags prior to calling in your locate request will help confirm to the locator(s) the exact location you will be excavating. Please inform us if you have done so. PHONE NUMBER – Phone number where you can be reached in case the utility owner or locator has any questions. Provide a contact cell phone number also if available. COMPANY NAME – Name of the company, individual or resident that will be performing the excavation. ADDRESS – Excavator’s mailing address. CALL BACK NUMBER – Secondary contact number. WORK TYPE – Type of work that will be requiring excavation. WORK DATE – The date the excavation will start. TIME – The time of day the excavation will start. COUNTY – The county the excavation will take place within. CITY – The closest incorporated city or nearest community to the excavation site. ADDRESS – The address where the excavation will take place. CLOSEST INTERSECTION – The closest major intersection or nearest intersecting road to the excavation site. EXPLOSIVES – Will explosives be used in the excavation? WHITE MARKINGS – Are there white paint or white flags indicating your excavation site? DIRECTIONAL BORING – Will you need to bore under a road, driveway, sidewalk, etc.? CUSTOMER – Who will your company be doing the work for? EXTENT – How long it will take your company to complete the excavation? SPECIAL INSTRUCTIONS – We can add special instructions needed to your locate request, such as “Contact caller for on-site meeting” or “Beware of dogs”. DRIVING DIRECTIONS/MARKING INSTRUCTIONS – Directions must begin from the intersection of two roads. Travel direction from that intersection (North, South, East, and West) and approximate distance (miles, feet, yards etc.) from that intersection. The Customer Service Representative will be using these directions to measure off the distance you give on a digital map. They will then mark the excavation site that will return a list of underground utility owners that will be notified. Good driving directions are key to notifying the correct utility owners. 1. From the intersection of HWY 111 and Smith Road go East on Smith Rd. approximately five (5) miles. Turn right on Blueberry Lane go approximately 500 feet site is located on the right side of the road at 224 Blueberry Lane. Locate the front of property. 2. Begin locating at the intersection of Wild Wood Dr. and Bramble Lane & continue south on the east side of Bramble Lane 660 feet. 3. Site located at the Post Office in the Northwest corner of the intersection of Main Street and 2nd Street. Locate the west side of the property.